It raised my awareness of the variety of experiences, opinions, and types of people that are involved in that work, and how important it was to being able to walk in another person’s shoes and understand why they wanted things a certain way. HITECH was tough; millions and millions of dollars spent, hundreds of thousands of hours, and lots of very heated discussions about what to do, and how, why, and when to do it, and what was accomplished was nothing short of miraculous. You don’t always get what you want. You do not always get your point across. But you keep at it. The hand has been dealt, and we have two choices. We can pick up that hand and play it and take advantage of our knowledge and our ability to make change, embrace it, and move forward, or we can leave the hand sitting on the table and let somebody else pick it up. I choose the former. If you take the time to learn and apply what you learn and take the time to be a constant learner, you can make a difference. When I see outcomes changing and team members growing and legislation that has the handprint of those of us who have the knowledge and passion, it’s very rewarding. Gamble: I’d like to talk about your advocacy work. How did you become involved, and how has it benefited you? Johnson: I’ve been doing advocacy work for as long as I’ve been a professional, but I became deeply involved when the HITECH Act was passed, for two reasons. First, I was selected by HHS to be on the original Standards Committee. I spent seven years doing that work and was intimately involved with the implementation work groups. In doing this, I began to understand how critical it was to the people with their feet on the ground, doing the real work, that we take these laws and translate them into tactics — and on the flip side, understanding the tactics and being able to translate it back to what policy and standards were needed. It raised my awareness of the variety of experiences, opinions, and types of people that are involved in that work, and how important it was to being able to walk in another person’s shoes and understand why they wanted things a certain way, and then translate that into a consensus. While I believe it’s our job to represent our part of the industry—whether you’re a CIO, nurse, or patient — it’s also about being a collaborator and being able to see the benefits. We have different objectives, but our values are the same, and that’s to move healthcare forward. This is not for self-benefit. This is about moving healthcare into a better place and taking advantage of having information that moves around by creating better outcomes and a better way to identify patients — all types of exciting things. To me, advocacy is about telling the story; understanding all the positions that are being put forward, and being able to consolidate those and recognize what’s best for everyone. In these types of collaborations, there is no winner takes all. The goal is to make decisions that are best for the people you serve. Gamble: In your opinion, does HITECH achieve that goal? Johnson: HITECH was tough; millions and millions of dollars spent, hundreds of thousands of hours, and lots of very heated discussions about what to do, and how, why, and when to do it, and what was accomplished was nothing short of miraculous. We started in the single digit percentages of healthcare providers that had digital records, and today we’re in the high-90s. To me, that’s unbelievable. Is it perfect? No. But is it an enormous step forward? Absolutely. Gamble: Is it difficult to carve out the time needed to participate in committees and advocacy events? Johnson: It definitely is. Tenet has been incredibly supportive of me doing this work, because it’s clear what the benefits are. It is clear that if we don’t have knowledgeable people at the table that have the energy and passion and vision, then the progress is going to slower. We’ll get there, but it’s going to be much slower. When you spend the time to be an advocate, you give up a lot. You’re away from your job and your family. It’s hard, because it’s not just the meetings themselves that take up time. You have to read up and pay attention, and that isn’t easy, since many of us didn’t come from a legislative background; we had to learn. We get a 2,000-plus page document and have to comb through it, with different people taking on different sections. But it’s worth it. And that’s the key — you have to believe that the work you’re doing makes a difference. And it does make a difference. Of course, you don’t always get what you want. You do not always get your point across. But you keep at it. A lot of people have given their time, energy, and intelligence to take what we’ve been presented and influence it, interpret it, and look for ways to improve it. Those are all the reasons you should get involved. One of the frustrations I hear with advocacy is that people will say, ‘I went to Capitol Hill and I only got to speak to a staffer.’ I can assure you with absolute clarity that it is important for the staff to understand the rules and why you feel the way you do, and to base it on facts, not emotion. Because they do influence what happens. Over the years, you’ll get to speak with congressmen, legislators, or the people who run the agencies. Those opportunities will most likely be afforded to you eventually, but the staffers are a huge influence, and that should never be negated. Gamble: I can imagine that the interactions with policymakers have changed since HITECH first started, because there’s much more of an understanding on their part about electronic records and things of that nature. Johnson: It definitely has changed. I think we learned together. We learned a lot more about the legislative process, about the work of the committees, about who to talk to and where the benefits are, and getting a group of like-minded people together to drive forward change. So I think we all learned. There’s no question that for the vast majority of the people we meet with, we still have fundamental conversations explaining what an EHR is or what digital media is; it’s not completely removed. On the other hand, we’ll say, ‘We keep seeing that this is stuck in X committee or it seems to be stalled. Help us understand why.’ So I think it’s been a mutual growth in our knowledge of each other’s roles, jobs, and expertise. Gamble: Looking back to when you first got into advocacy, I’m sure there have been enormous changes from your perspective. Johnson: It’s incredible to me. Because I’m someone who embraces and thrives on change, always hoping for the best and trying to keep that ‘glass is half-full’ mentality, I know we’re in for a lot of changes in the next two years, and I think that’s a good thing. The last time I was asked what I think of the election and the various appointees, my answer was, ‘I don’t know yet.’ I’m reading everything I can get my hands on, but the media is the media. You’re going to get given what you get given and none of us have time — at least, I don’t — to listen to everything firsthand. You’re going to be subject to people speaking and writing from their own context. That’s okay, but rather than be concerned about who could have been elected or who did get elected, it’s my thought that the hand has been dealt, and we have two choices. We can pick up that hand and play it and take advantage of our knowledge and our ability to make change and embrace it and move forward, or we can leave the hand sitting on the table and let somebody else pick it up. I choose the former. I’m anxious to learn more about what’s going to happen and how we can translate that into our world and use it to the advantage of our organizations, our patients, our clinicians, rather than second-guessing what could have happened. I don’t think, generally speaking, that leads to particularly effective outcomes. I think you should be cognizant and pay attention. By that, I’m not saying to put on rose-colored glasses and ignore the obvious. I’m saying be open, be ready to listen and hear and think about how can this be used in a way that’s positive. And in those cases where you don’t understand what’s happening, ask questions. Clarify. Make sure you’re reacting to the right information, and be proactive in your reaction, interpretation, and implementation of what needs to be done. Gamble: It’s clear that you have such passion for what you do. It shows through, and it becomes even more important when there are so many things on your plate, that you have that passion as a driving force. Johnson: When I got into healthcare many years ago, I did it because there was something inside of me that believed that if you take the time to learn and apply what you learn and take the time to be a constant learner, you can make a difference. When I see outcomes changing and team members growing and legislation that has the handprint of those of us who have the knowledge and passion, it’s very rewarding. It’s my job to make sure we grow those who follow us, and give them the skills they need and acknowledge them. They’re the ones who are going to carry the banner going forward. And when I think about motivation, a lot of us have our own internal mechanisms for evaluating what we’ve done and embracing the joy of that impact, it’s an amazing feeling. But we need to give that recognition to others. When you achieve positive outcomes that are making an impact, you need to share that. It’s not, ‘look what I did,’ it’s ‘look what the team has accomplished. Look what the clinicians have accomplished. Look how our patients feel.’ I haven’t met a person yet who can do that by himself or herself. When you take that collaborative and collective spirit, what you get is amazing. Gamble: It’s funny, I was just talking to my dad about the whole idea of recognition and how that really goes a long way with people. It doesn’t take a huge effort to make people feel appreciated. Johnson: Absolutely. And all of us get busy and forget. But whatever it takes to remind you to say thank you, to give public and personal recognition, do it, because people have choices. If they feel like they’re working in an environment where their work is acknowledged, they’re going to be more engaged. I’m always stunned when someone says, ’15 years ago when I heard you speak, I thought it was a great idea, and this is what I did with it.’ It’s so heartwarming, and honestly, it makes you want to keep going. Gamble: Absolutely. 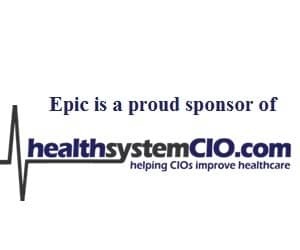 Well, I want to thank you so much for taking the time to speak with healthsystemCIO.com. It’s been great getting to learn more about what drives you. Thank you, and I hope we can speak again! Johnson: You’re welcome, and thanks for taking the time.